At Rod Works we offer unique and charming Home Decor at incredible prices. The imaginative way we display our products will get your creativity flowing while our outstanding customer service will work with you one on one to create a one of a kind look for any room in your home. You will enjoy the inspiring beauty and top notch quality that is at the very foundation of our products.Visit us today or read some expert decorating tips. It might still be just the end of October, but it’s never too early to start shopping for Christmas gifts. When you have coworkers, friends, siblings, parents, kids, in-laws, and a spouse to shop for — there’s a lot to get done! So yes, the holiday season may still be about two months away, but now is the time to start telling yourself that you need to shop! And when you don’t actually shop until the beginning of December (or maybe the week before Christmas), you will at least have put some thought into what you want to get for everyone. Whoever you’re shopping for, home decor and home accessories are always a great option. 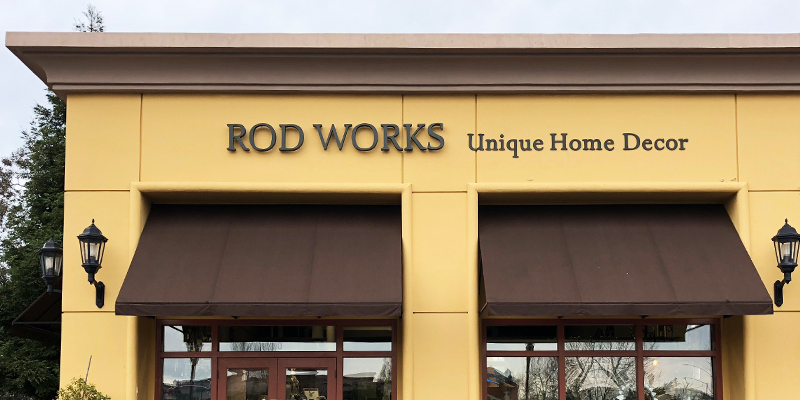 Here at Rod Works, we may be slightly biased, but we believe everyone should have a few items in their home that makes it feel warm and cozy. Our home decor store has a variety of cute, fun, playful, sophisticated, and antique products that we can’t wait to show you. Come visit us today in Roseville! Small Plates: A set of small appetizer plates with a cute or colorful design on them will brighten up the room and are perfect to have around when guests come for dinner. And they can be used for all sorts of occasions. Mason Jars: It may seem like too simple of a gift, but a set of mason jars has several uses around the house. They’re great for pencil and pen holders, herb gardens, or water glasses; or you can put something special in the jars, like a hot cocoa mix, sugar scrub, or even fill them up with soil and a succulent. Wine Decanter: If the gift receiver loves wine, give them something that will make them love the experience even more! A wine decanter will open up the aroma and flavors of the wine, which is great for any wine connoisseur. And the perfect accessory to this gift? A bottle of wine of course! Trays: If you already know that the receiver has a big enough countertop in the bathroom, a small tray is a perfect accessory. They can put all sorts of items on it too, such as jewelry, safety pins, cute miniature figurines, potpourri, or small candles. Soaps: If you know anyone who loves relaxing in the tub after a long day of work, soap is a go-to gift. And don’t feel like you have to give bars of soap, you can think outside of the box to lotions, hair products, bath salts, and more. Small Plants: You don’t see many bathrooms with plants in them, so this makes giving a plant a unique choice! However, be mindful of the size of the bathroom and the plant you’re considering. You don’t want to overwhelm an open shelf or countertop with an oversized plant. Keep it simple with a small container and a cute succulent. Frames: When shopping decor stores for frames, look for one that isn’t too big or overwhelming, keep the colors neutral, and consider the shape. A picture frame can be used in any room and the receiver can choose their own image or piece of art to go in it. Mirrors: Another functional gift, a mirror can be placed in an entryway or any room in the home. Similar to a frame, keep the mirror simple and possibly on the smaller side so it doesn’t take up a large chunk of a wall. Key Holder: It might sound boring, but the right key holder can have a big impact on an entryway wall. The holder can be in various shapes, animals, a word, and it can have more than just hooks for keys, but a holder for mail as well. The living room is a space that gets a lot of traffic. Other than the kitchen, this may be the room in a home that people spend the most time in. So if there’s an opportunity to add some decor to the space, go for it! There are endless options when it comes to the living room, so have fun with it, go with a bright accent color, or choose a piece that will complement the rest of the home. Candles: They smell great, they look cozy, and they cast a beautiful glow on the room — there’s nothing wrong with giving a candle as a holiday gift. The important thing to keep in mind is that the scent is only part of the gift, think also about the container and what images, designs, or words are on it. Blankets: The weather in Roseville doesn’t get too cold, but a throw blanket still gives a room a cozy and warm feeling to it. A blanket can be as simple or as personal as you want it — choose one with a neutral color or you can even have them monogrammed with the family’s last name. Bookends: Even if the receiver doesn’t love to read, a bookshelf with a few books and knick-knacks on it gives the space personality. Bookends themselves have personality, whether it’s two halves of an animal, two halves of a word, or a travel theme. Choose a pair that represents the receiver’s style and hobbies. 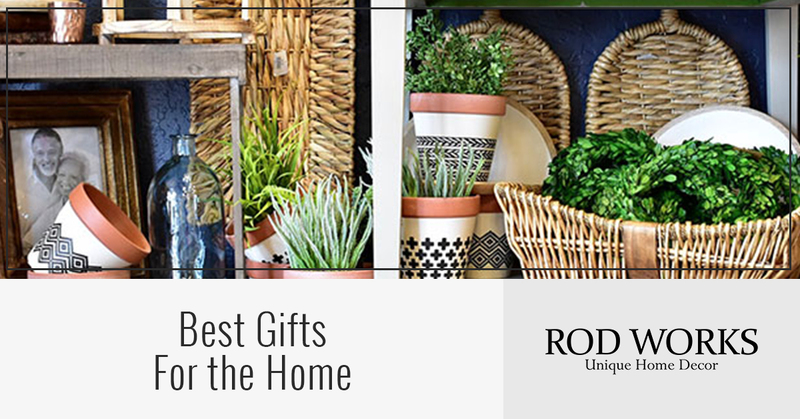 Home decor gifts are fun, functional, and they can enhance the look of a room! If you’re still having trouble picking out that perfect gift, stop by our home decor store in Roseville, CA. Our staff can’t wait to show you around and help you pick all sorts of Christmas gifts. Now get shopping!